Yes! 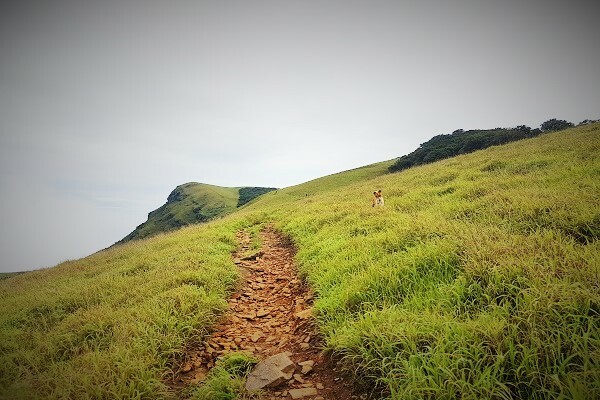 That’s me, hiking towards the beautiful peak of Kudremukh. 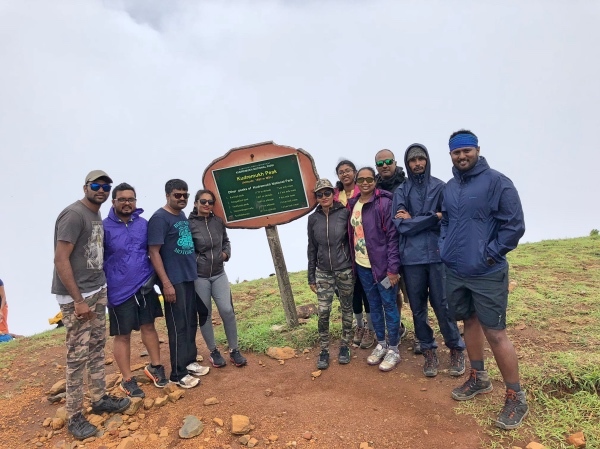 Our group was the first one to enter the range – thanks to our trek leader Naveen. Hence, when we reached atop, there was no one and I was the first one to summit the peak that day!!!! 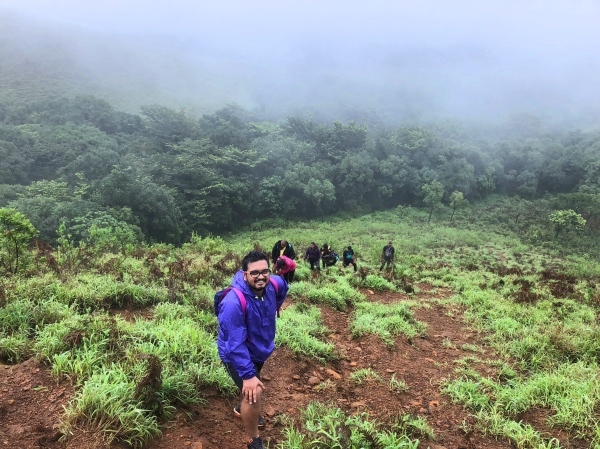 June 30, 2018, was the date when I overcame my one of the greatest fears – leeches – by embarking on one of the most beautiful monsoon treks of Karnataka – Kudremukh. 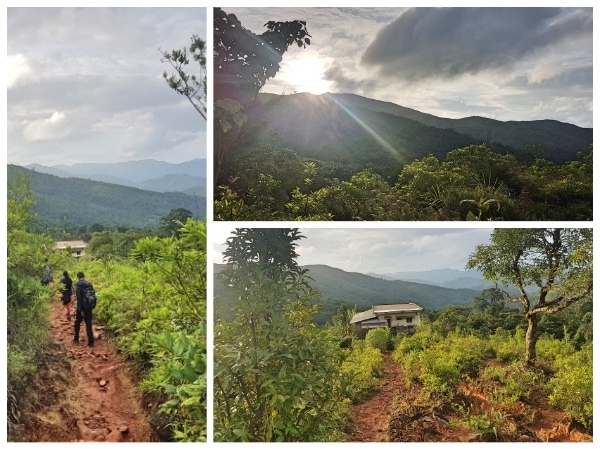 Trek to Kudremukh was in my to-do list from past one year but somehow I wasn’t able to do it. 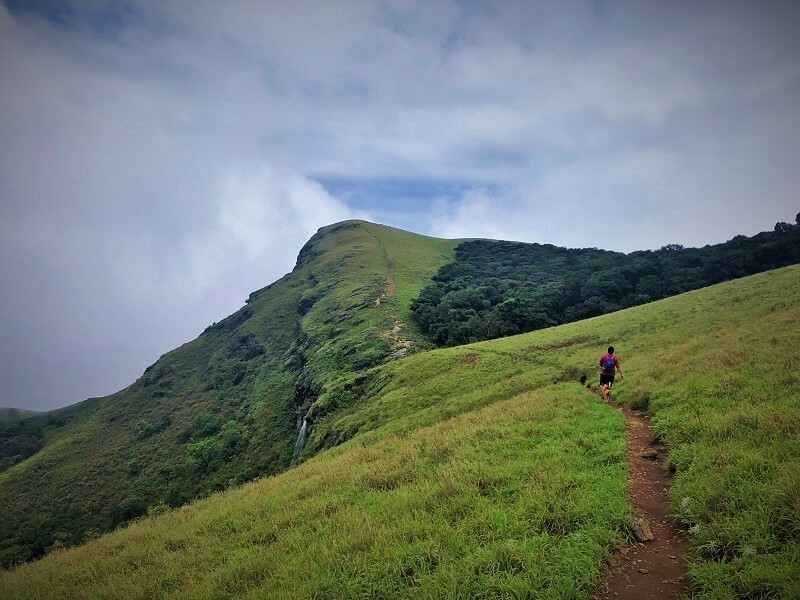 But on June 30, 2018, I finally summited the Kudremukh peak and trust me, it is my most beautiful and thrilling trekking experience. 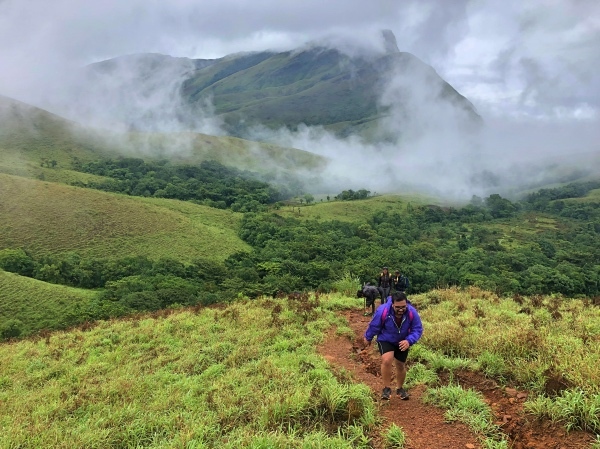 Starting from the dense rainforest of Kudremukh National Park, followed by the mountainous trails covered with the blankets of green grass and clouds, Kudremukh Trek during the monsoon is one hell of a sight. 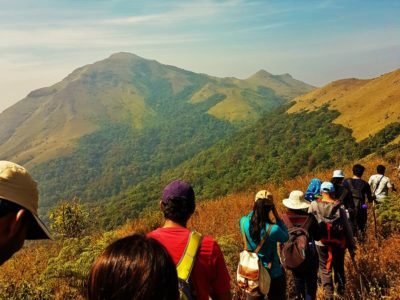 I went to Kudremukh Trek via an amazing trekking group called TrekNomads. You can find more about the group by following their Facebook page. TrekNomads conduct treks every weekend and you can find the schedule from their events page. 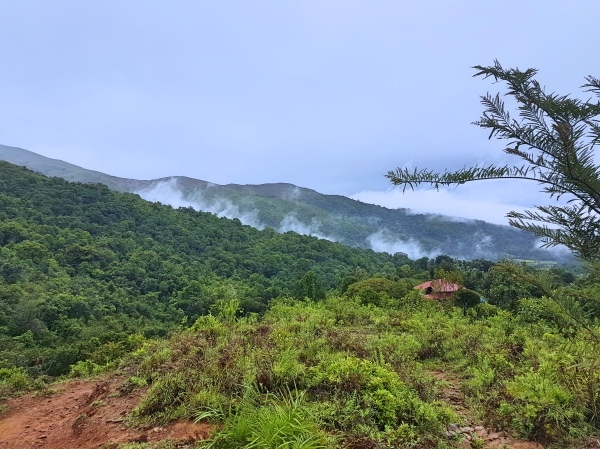 Nestled amidst the Kudremukh National Park, which is the second largest wildlife protected area of Western Ghats, Kudremukh Peak is in the Chikmagalur District. 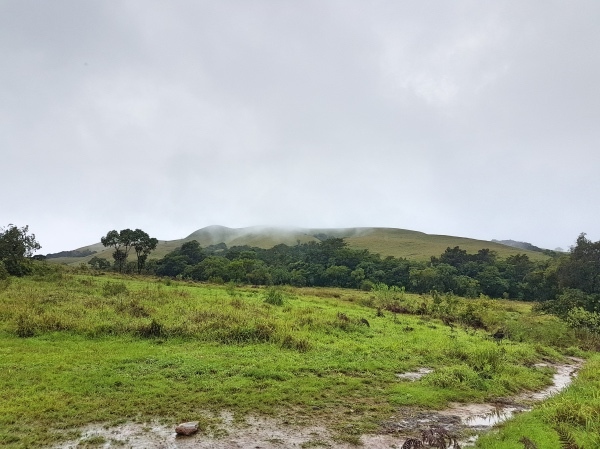 Kudremukh is the second highest peak of Karnataka with the height of 1894 meters or 6214 feet from the mean sea level. Literally meaning ‘horse-face‘ in Kannada, Kudremukh Peak boasts some of the most beautiful views of Western Ghats. 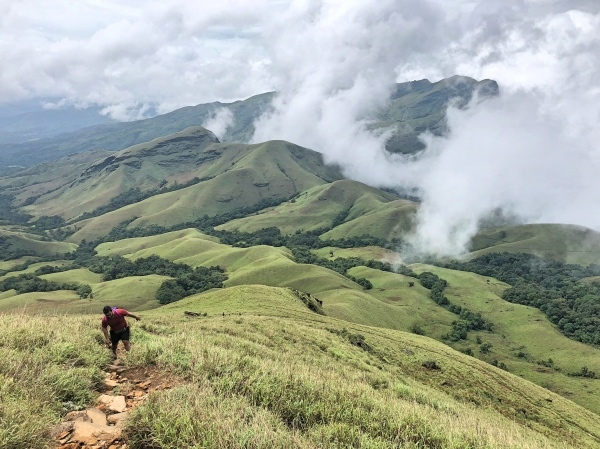 The trek to Kudremukh Peak is one of the longest treks of Karnataka with a distance of around 10 KM one-way. 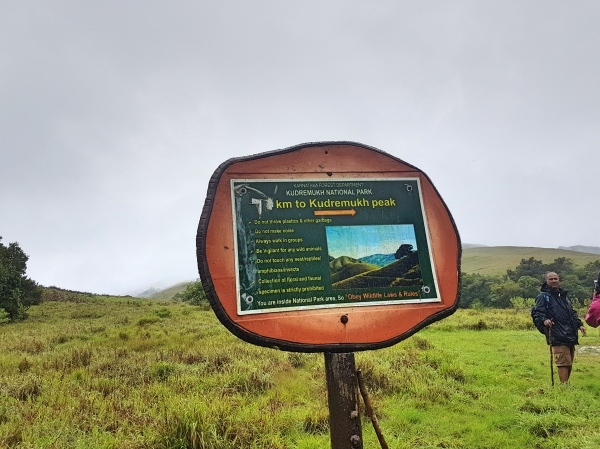 The starting point of Kudremukh Peak trek is Mullodi Village in the Chikmagalur District and is around 340 KM from Bangalore. 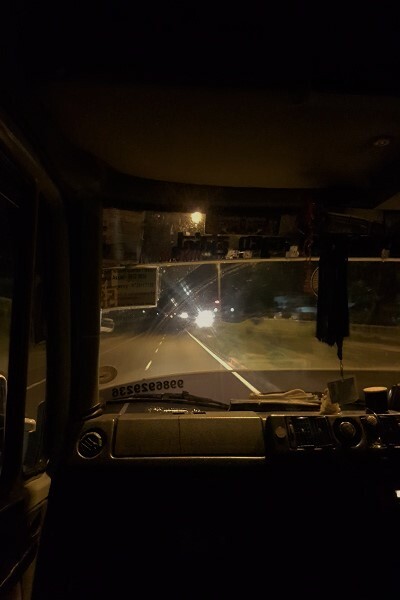 Hence, to start the trek to Kudremukh in the morning, we left Bangalore at around 10.30 PM. 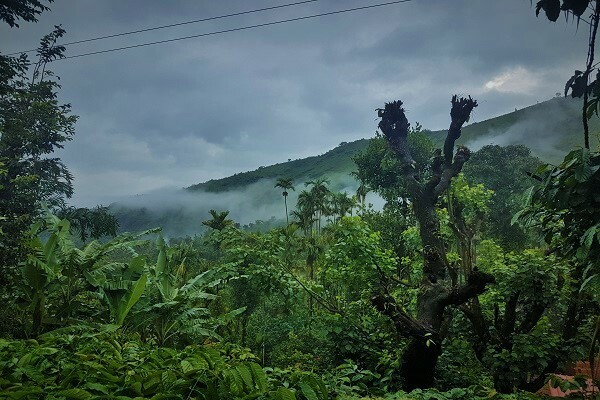 An 8-hours overnight drive and you wake up to the misty hills of Kudremukh Range. Our tempo traveler reached Balagal Village at around 6.30 AM, which is the base and entrance gate for Kudremukh Trek. 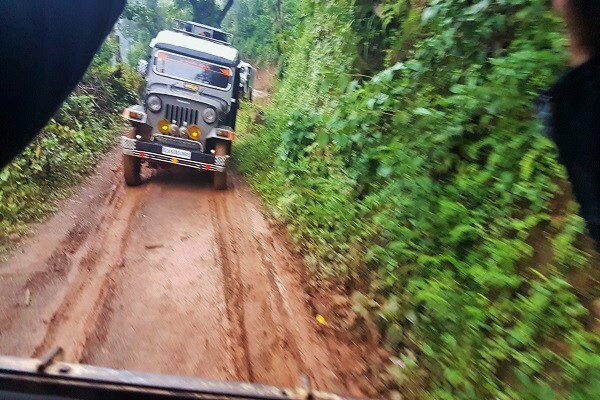 Next comes up an adventurous 30-45 minutes off-road jeep ride for about 6 KM, which takes you to your homestay in Mullodi Village. The journey till Mullodi is one of the bumpiest rides I’ve been to. We were literally driving into muds. You can guess the amount of adventure we had while reaching our homestay from the pictures. It was the end of June and rains were at their peak. We found various small streams whilst driving towards Mullodi. Also, the scenery was breathtaking. 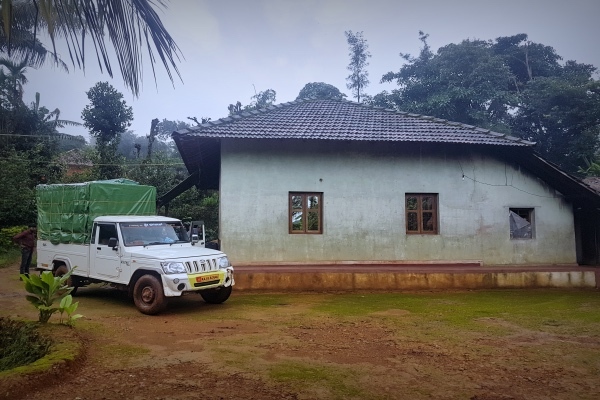 There are only four homestays in Mullodi, which accommodate the guests who come to summit the Kudremukh Peak. 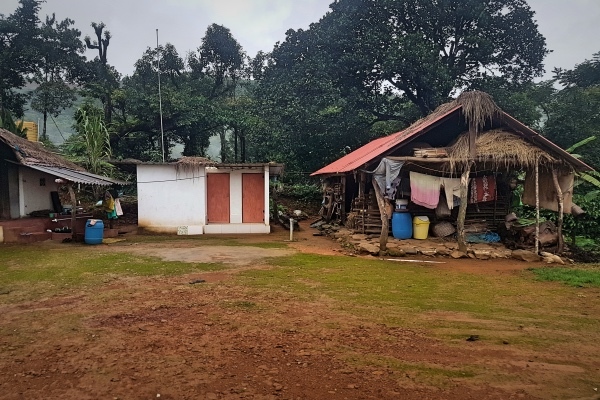 Our homestay was beautiful with a number of rooms to accommodate guests; Indian & western style toilets, running hot water and an amazing host. After reaching the homestay, we freshened up and had a hot & delicious breakfast prepared by our host. There was ample space outside where you can sit and enjoy a bonfire and get rid of the trekking tiredness aftermath. It was cloudy and drizzling when we geared up for the trek. I was super excited to begin the trek as I waited for this moment from past one year. However, at the same time, I was quite nervous. I was about to face my one of the biggest fears – leeches. I had a good idea what leeches do but I had no idea how to save myself from leeches, and I had no idea what I’m going to do if a leech climbs up my body! At around 8.30 AM, we all were set to leave. After a small briefing from our trek leader Naveen, we started to walk. 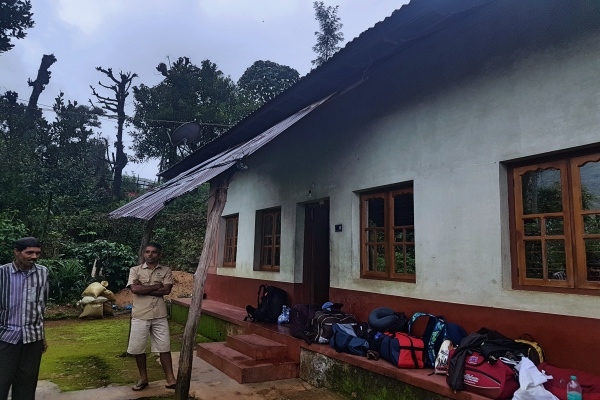 Around half a kilometer from the homestay is the check-post of Kudremukh National Park, which is the entry point to trek range. 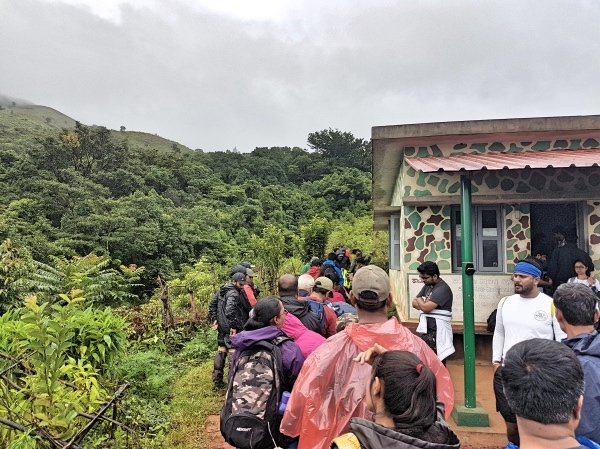 You have to have the permission before you can embark on the trek to Kudremukh Peak otherwise they won’t allow you. There are strict entry and exit timings to the National Park. You HAVE TO cross the check-post by 9 AM and exit it by 6 PM. Also, you need to carry an ID proof otherwise you won’t be allowed to go for the trek. 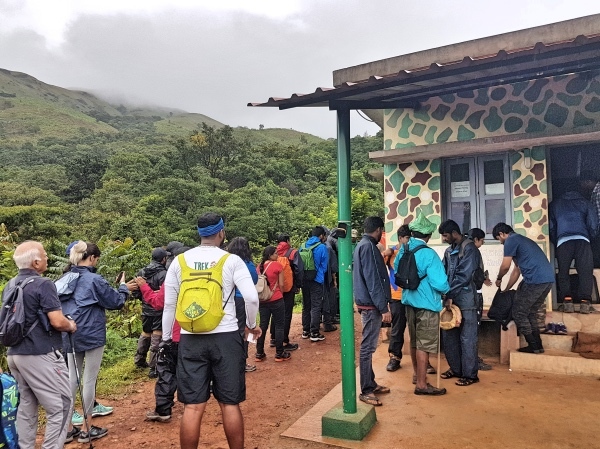 When we reached check-post there were already a number of trekking groups waiting to enter the Kudremukh National Park. Standing and waiting there for our turn, we got the gist of what was waiting for us ahead on the journey. It was all green and fresh at the time. The surrounding mountains were covered with clouds making it breathtakingly beautiful. After around 15 minutes, it was our turn to enter the trek range. Surprisingly, despite a number of groups who were present there before us, we were the first one to cross that check-post. 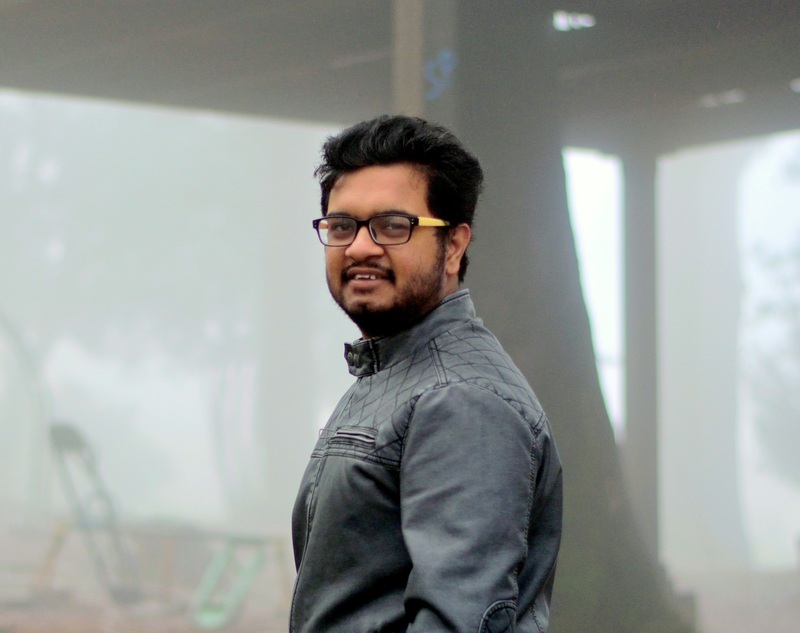 All credit goes to our amazingly amazing trek leader – Naveen! 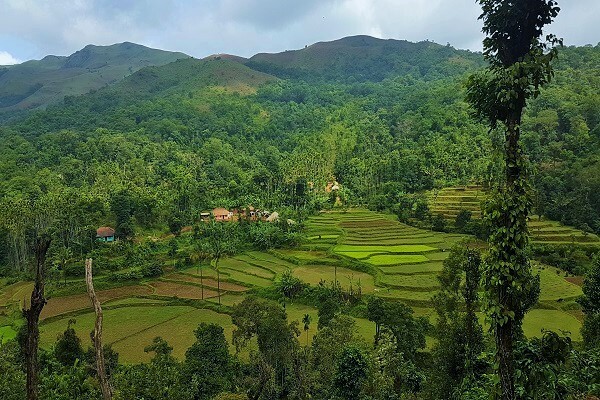 It was the month of June, and hence, the monsoon in the Western Ghats was at its peak. 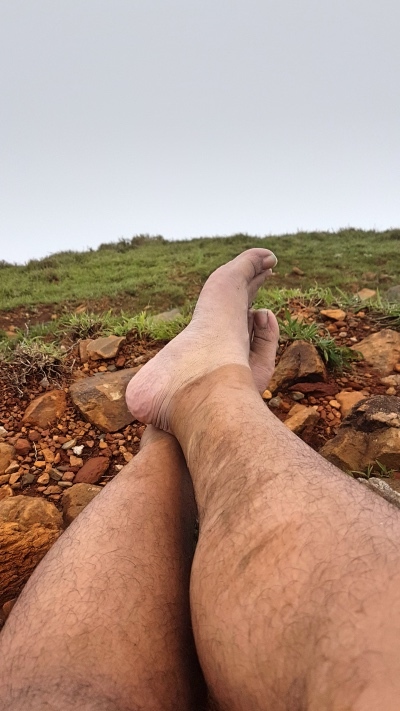 The complete trail to Kudremukh Peak was muddy and slippery, making it a little difficult to walk especially where the trail was rocky. 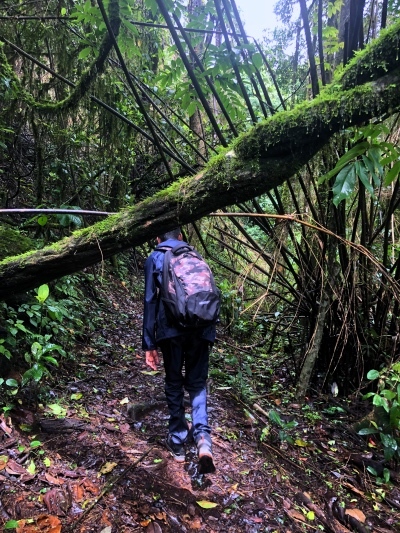 As we started walking, I started getting a little scared, because I knew, that the time has come to face the biggest fear of this trek – LEECHES. Whilst walking, I was staring on the ground and constantly checking for the leeches, trying to avoid them at any cost. But the truth – my dear friends – is that you just CANNOT avoid them. The whole trekking group walks between a trek leader and a sweeper, the guy who walks at the end and makes sure no one is left behind. In our group, Naveen was our leader and a local villager was the sweeper. As I was constantly checking for the leeches, my speed was comparatively slow and without any surprise, I was the last one in the group. One kilometer in the trekking and I had my first encounter with the leech. I had no idea when it climbed to my legs, I just felt that someone’s moving up my body. Obviously, I got anxious but then I calmed myself down and peacefully removed the leech from my body. After this, I gained a little confidence and was no longer afraid of the leeches. However, I kept constantly checking for them throughout the trek. Literally, this is the only tree standing in the vicinity! 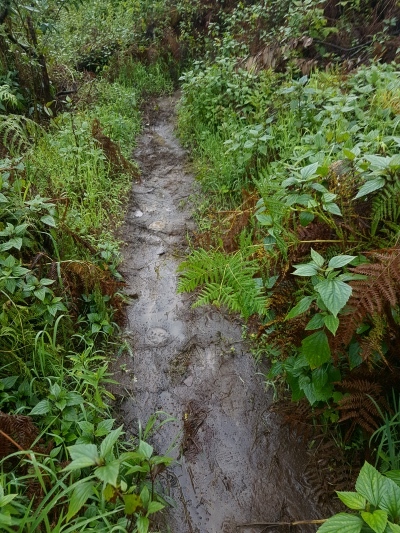 On the way, the small streams were flowing in all their glory because of the rainy season. Hence, unlike my trek to Tadiandamol Peak, I did not have to worry about the shortage of water. Throughout the journey, I had sources of fresh water flowing down from the peak. At this point, everyone in the group relaxed a bit and re-energized themselves along with the mandatory group photo. 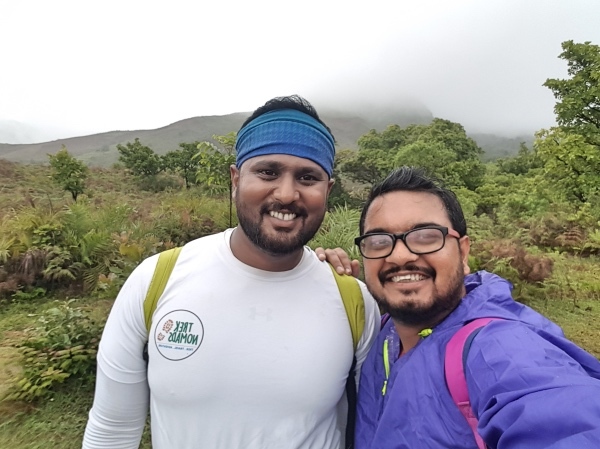 After a while, we continued our trek to Kudremukh Peak. The trail from here up to a few 100 meters passed through the open marshy lands. 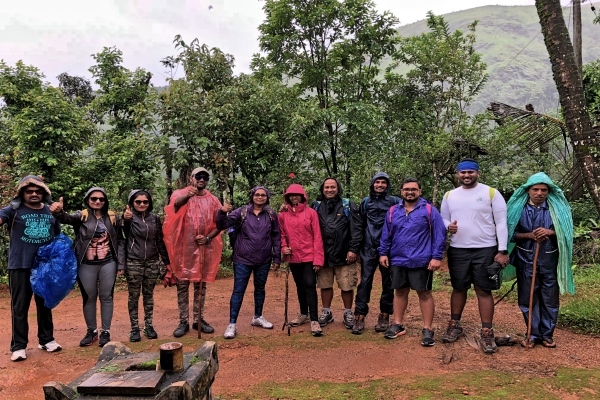 Throughout the Kudremukh trek, it was drizzling and a few times in between it rained heavily, which made us wear raincoat the whole time. Overall the weather was amazing and perfect to call it a monsoon trek. 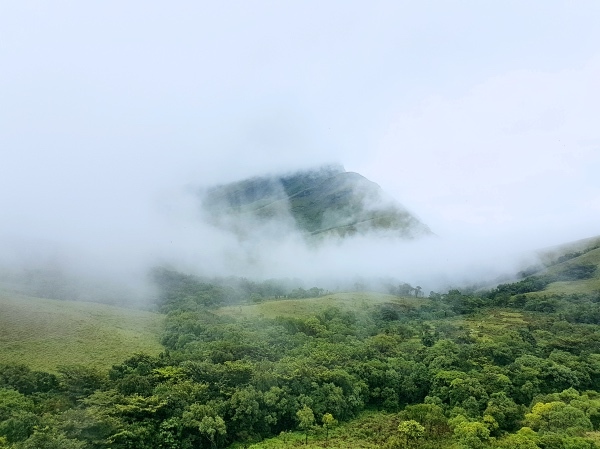 Once we crossed the marshy lands, the initial ascent to Kudremukh welcomed us. The terrain changed from open lands to narrow trail with an inclination. Everyone slowed down a bit, first because of the inclination and second because of the slippery trails, making it a little difficult to form the grip. 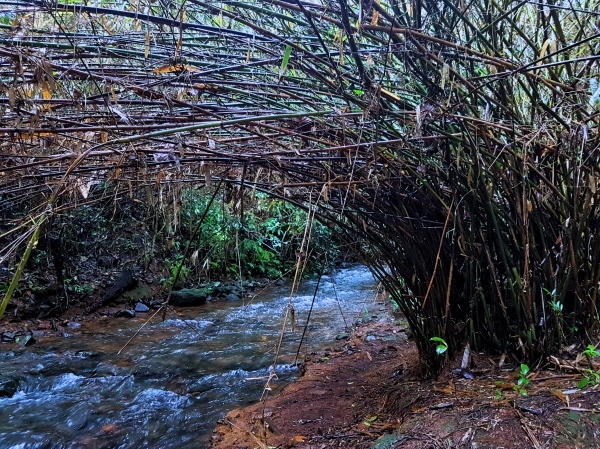 Leeches were also on their full glory throughout the trek to Kudremukh Peak. Moreover, constant rains and muddy trails were their support. Once I was at a little height, I stopped for a small rest and looked back! The scenery from there was so breathtaking, which is indescribable in words. 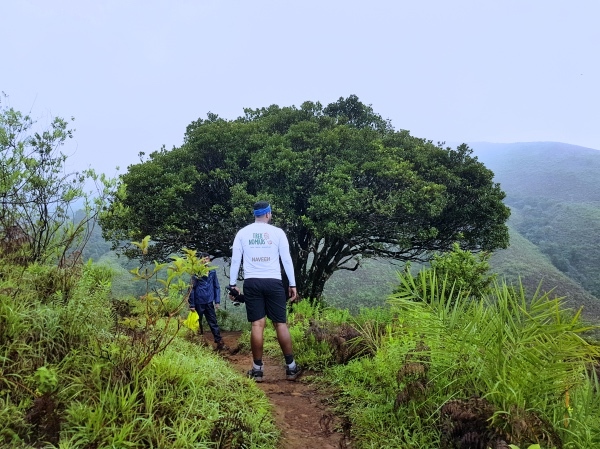 Trek to Kudremukh Peak offers a wide variety of trails. 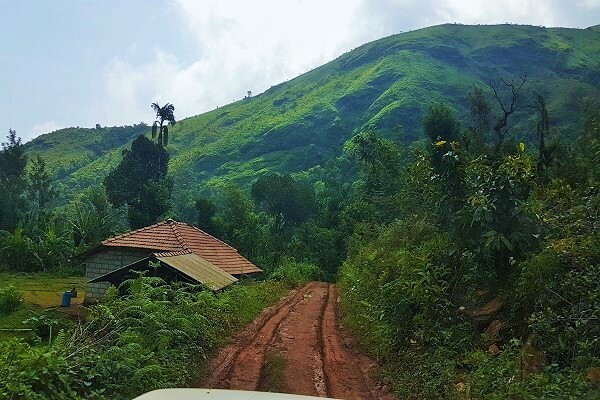 From open marshy lands and narrow mountainous trails to trails passing through the thick forest of Kudremukh National Park, you get the taste of every type. 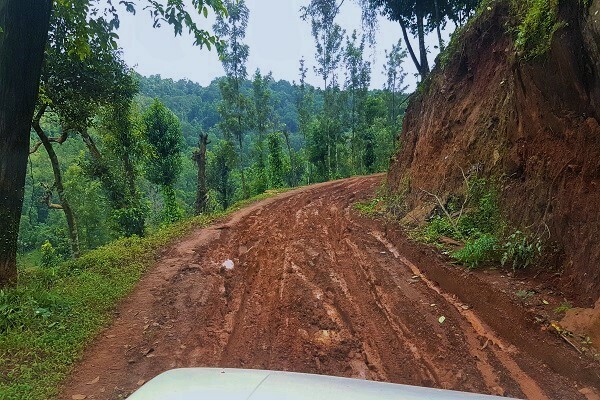 After some time, we entered the dense forest of Kudremukh National Park, which is full of rich flora and fauna. 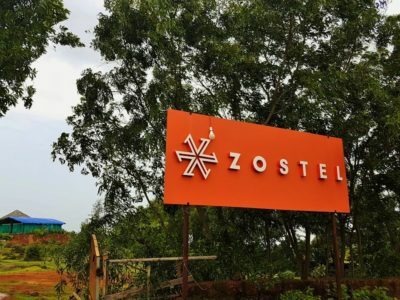 Primarily covered with evergreen forest, you can find the plantation of Acacia Auriculiromis, Casuarinas, Eucalyptus, Grevillea Robusta and much more. Tea & coffee plantation are also a major part of Kudremukh National Park. It is recommended that you pack light. I carried a bottle of water because of available water streams, a packed lunch, which our host gave us, power bank and raincoat. A small backpack will be enough to carry all these things. 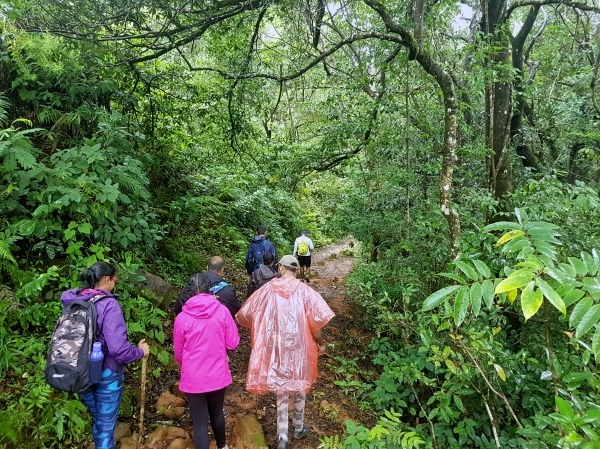 If you’re planning your first trek to anywhere, do not miss reading my trekking tips for first-time trekkers, which I learned during my trek to Tadiandamol Peak in Coorg. As you can see in the pictures, the streams were overflowing, providing a source of fresh water. 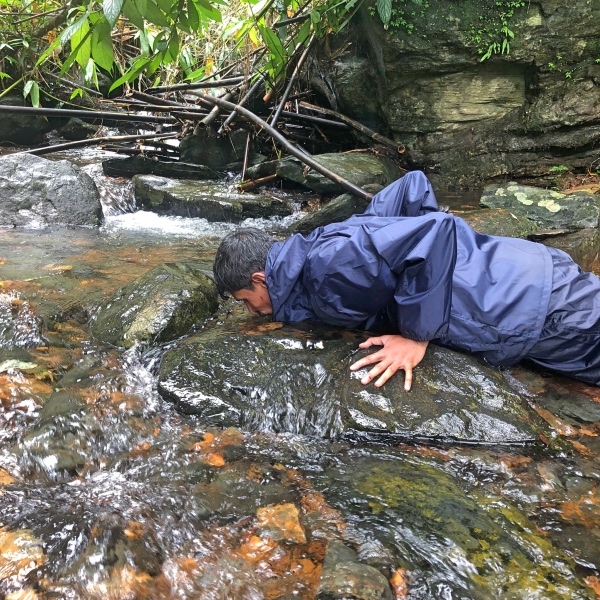 It was so sweet that our fellow trekker Krithi lied down and freshened himself up with some water directly from the stream. Passing through these dense jungles made me a little anxious. 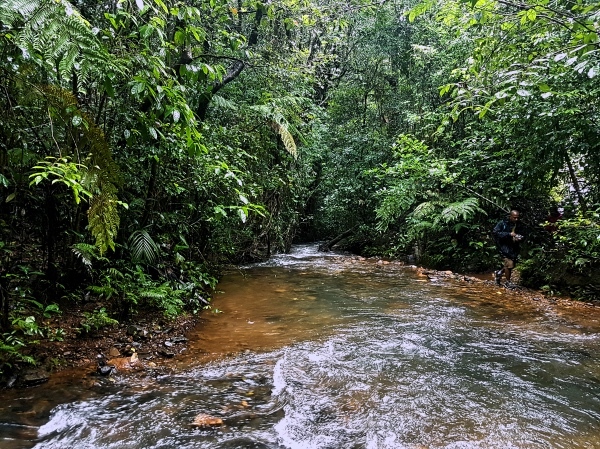 Though I was pretty confident in dealing with the leeches, still I wanted to avoid them at any cost and hence, as usual, I was constantly checking for them. Because the forest was dense and it was difficult getting any sunlight here, the number of leeches were double than normal. I just wanted to cross this part as soon as possible and hence, I didn’t stop anywhere in between, not even to drink water or to take any rest. 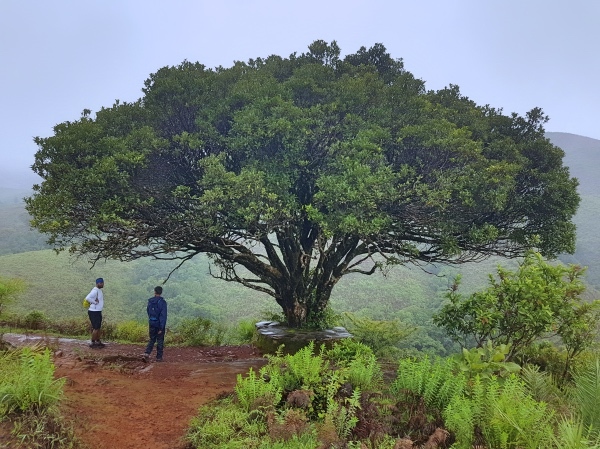 2 KM of walking and these dense forests open up to a mesmerizing view of green velvety mountains and there is yet another lone tree, which is the sign that you’ve come halfway. Meaning, another chance to stop and re-energize yourself. It is the last stop before the final ascent. From here, the inclination was about to increase to a great extent but the good part was that the weather was getting better. 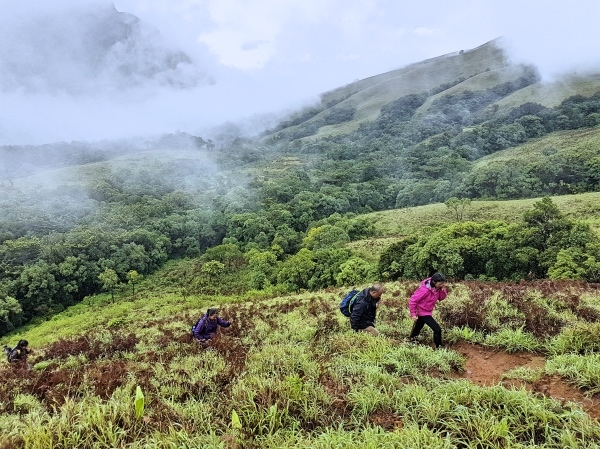 At around 11.30 AM, we started our final ascent to Kudremukh Peak. I was excited and tired at the same time. 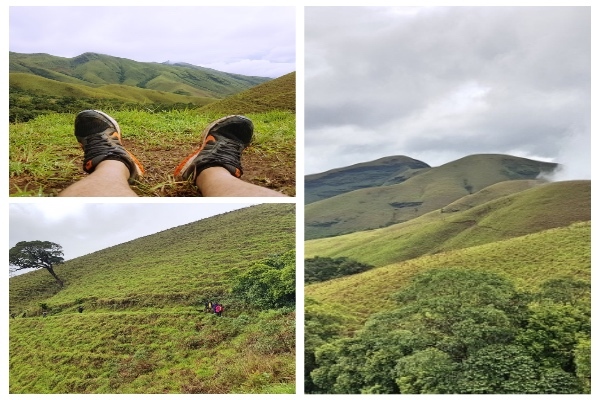 But the beautiful scenery of Kudremukh Range and amazing weather kept pushing me during my entire trek to Kudremukh Peak. 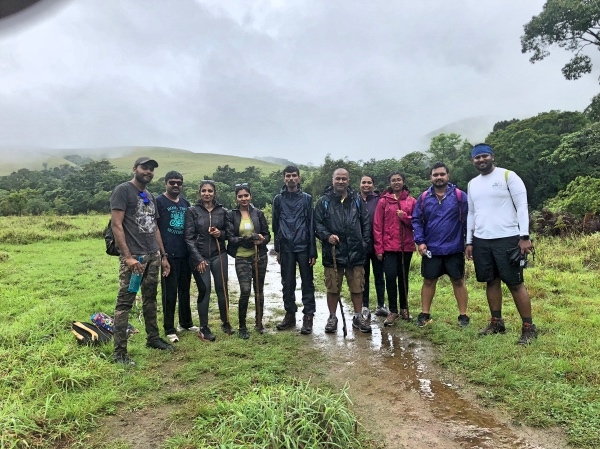 Also, it became a little sunny during the final ascent of Kudremukh trek and hence, the number of leeches on the trail reduced to a great extent. The final two kilometers were pretty easy. It was almost a straight walk to the peak. However, we were walking constantly for around four hours and everyone was too tired. Moreover, there were no water sources at the top to refill our water bottles. Me, our trek leader Naveen and Kirthi, our fellow trekker, were the first one to reach near the summit. When we reached here, I saw other groups coming behind us. At this point, I decided that I want to be the first one today to reach the summit. I was dead tired but Naveen kept pushing me constantly and finally I made it. Yes! 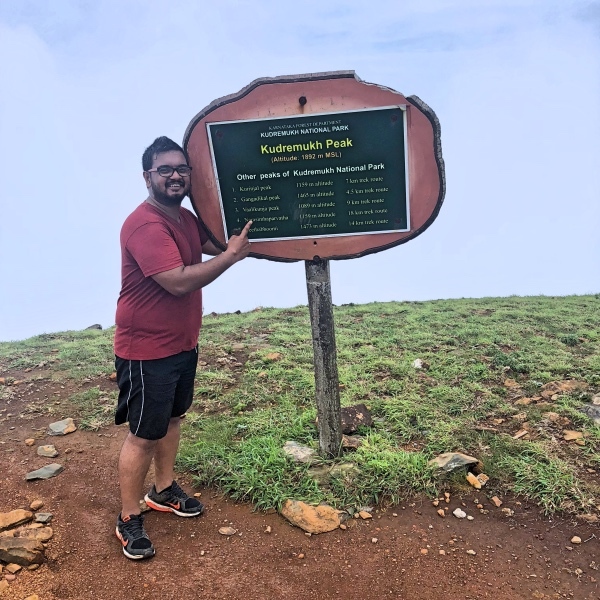 I was the first one to reach at the Kudremukh Peak that day. The first thing after reaching the peak, even before taking rest, I did was to take a picture with 0 KM mark. It was an indescribable feeling for me because I was waiting for this moment from past one year and TrekNomads made this possible for me. 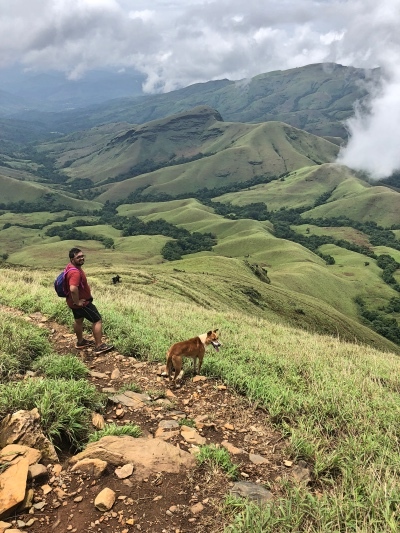 This Kudremukh Trek was exactly the way I wanted it to be. 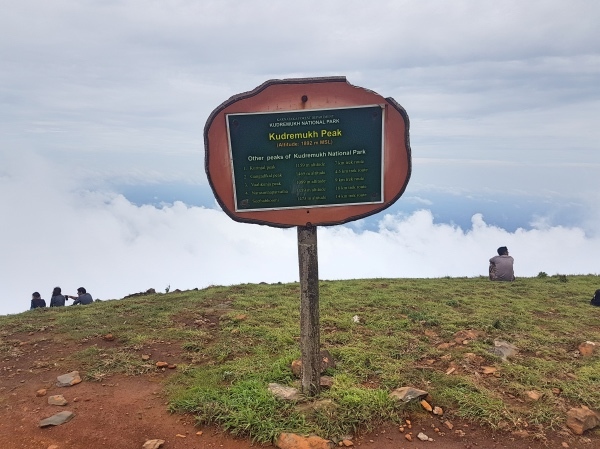 The weather throughout the trek was pleasant; the trail was full of leeches and clouds were below us when we reached atop. 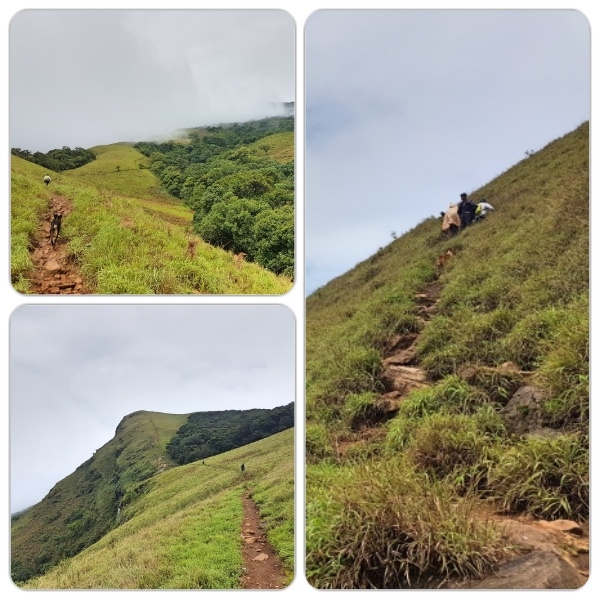 Once at the top, we all rested for a bit, clicked a few pictures had our remaining packed lunch and started our journey back to the Mullodi Village, which is the starting point of Kudremukh Peak. 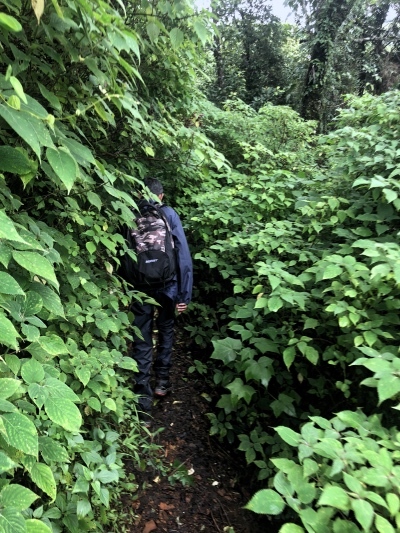 Whilst returning back it was all sunny – Thank God – which made leeches disappear completely, meaning there were no leeches on the entire trail, except where it was dense forest. We reached our homestay at around 5.30 PM. 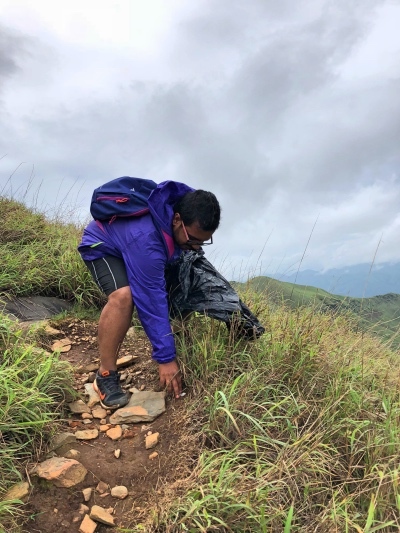 TrekNomads is completely against polluting the trekking trails as these trails are the part of nature and it is the duty of every trekker to keep them clean and preserve nature. 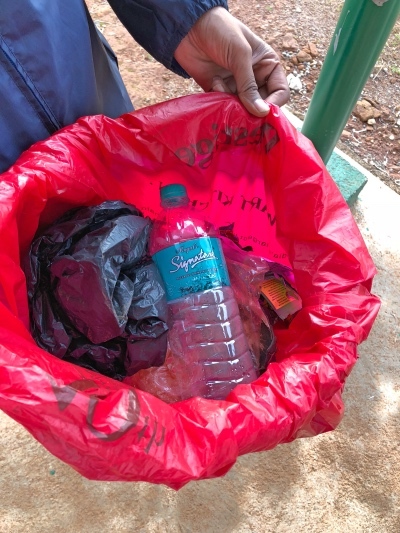 Therefore, everyone in the TrekNomads group carries a garbage bag where they can dump their waste during the trek. 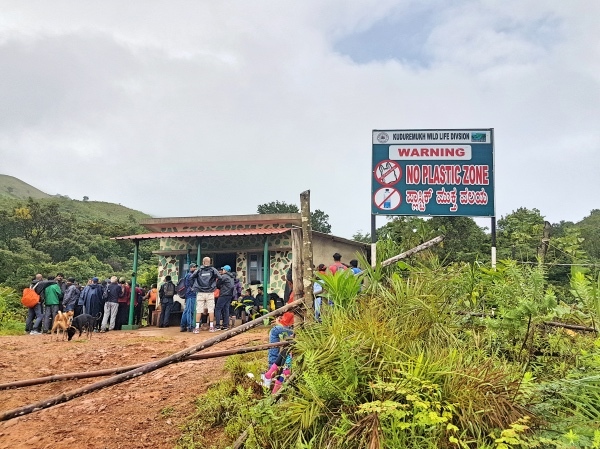 Moreover, they also encourage to clean the trails and collect the garbage, if found during the trek and dump them at the check-post in dustbins. 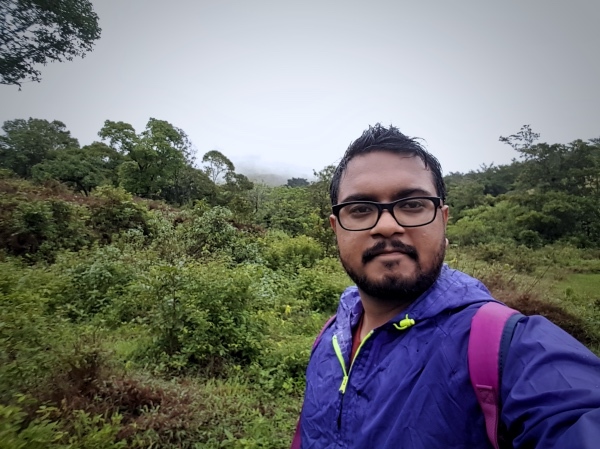 So, this was my Kudremukh Trekking experience. During the entire trek, I had a lot of fun. No, it was not an easy trek but it’s worth doing at least once, whether you love or hate trekking because the views are really mesmerizing. Also, I gained confidence in dealing with leeches but NO I don’t want to deal with them ever again. 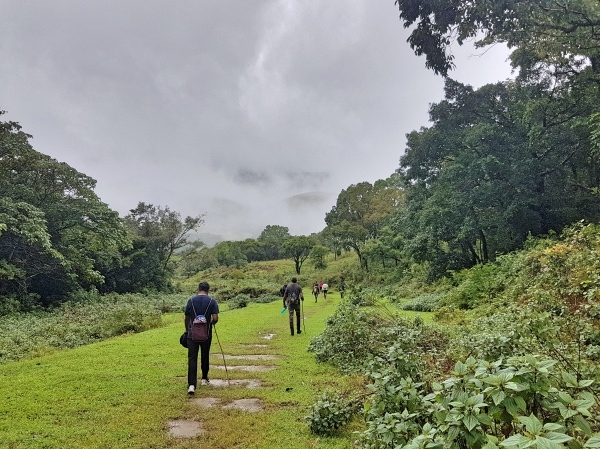 I hope you liked this blog on the trek to Kudremukh Peak. If yes, please follow me on Instagram and Facebook. 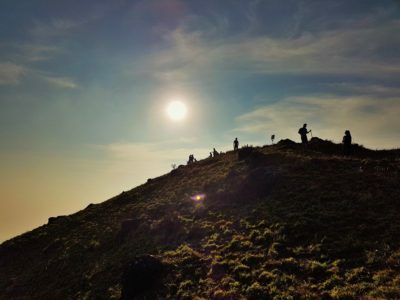 Also, follow TrekNomads to get their updates and check their events page to know about their upcoming treks.